Vientiane (VNA) – A delegation from the Vietnamese Embassy in Laos led Minister-Counsellor Nguyen Thanh Tung on March 29 presented 20 computer sets to Nguyen Du Lao-Vietnamese bilingual school as gifts from Party General Secretary and President Nguyen Phu Trong. The Vietnamese Party and State leader offered the gifts to the school during his Laos visit in late February. 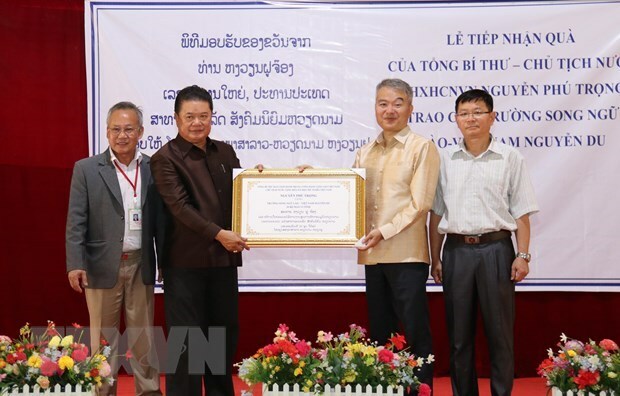 Addressing the ceremony to hand over the presents to the school, Minister-Counsellor Tung said that the Nguyen Du Lao-Vietnamese bilingual school is one of the symbols of the Vietnam-Laos special ties. He said that the gifts show the Vietnamese leader’s special attention to students and teachers of the school, as well as his hope to improve the teaching and studying conditions for them through better technology access. Principal of the school Pham Xuan Phan thanked the Vietnamese leader for paying great attention to the school. He pledged that he, teachers and staff of the school will work harder to complete their tasks, turning the school into a model in education quality, and contributing to reinforcing and developing the special solidarity between Vietnam and Laos. Phan promised that the computers will be used effectively for teaching and studying activities.